One of the most luxurious experiences I know is Maine lobster, in any kind or form. Lobster roll made with fresh mayonnaise, celery and lobster meat in abundance. Freshly boiled lobster, still hot, served with melted butter only. 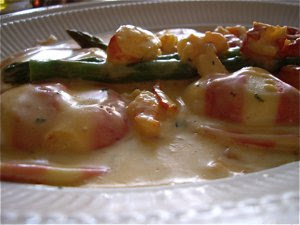 Sublime and exquisite lobster raviolis, served in a rich, smooth and creamy seafood sauce. As I roamed the narrow streets of Boston’s North End, looking for a place to enjoy my lunch, lobster raviolis were one of many choices at Assaggio, and guess which I made? Not a hard question to answer. Choosing the lobster raviolis, I was in for pure bliss. The North End is the oldest part of Boston. It is criss-crossed by small alleys. Here you find houses going back to the dawn of the United States and beyond. 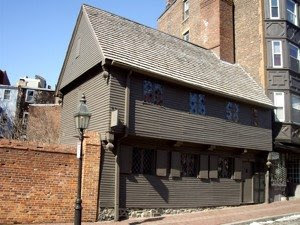 The home of Paul Revere (below), the famous hero from the American Revolution, predates the constitution with more than a century. North End, once a home for the first generation of Irish immigrants, is now the dominated by the Italians. Here you find family owned hole-in-the-walls restaurants serving food only surpassed by the cooks in the home country itself. When visiting Boston, the narrow streets of the North End are one of my first choices, when looking for a good place to eat. With no research in advance, it may be difficult to choose the right place to eat as there are many restaurants in a small area. 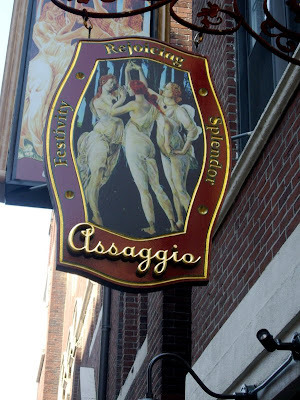 I found Assaggio discreetly tucked away a side street of one of the main streets of the North End. I quite honestly found the interior at Assaggio a little kitch. It was not ugly in any way, but very predictable. 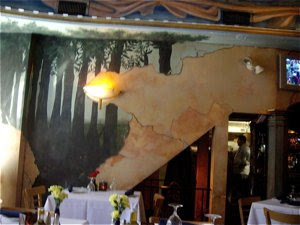 It looked like an Italian restaurant is supposed to look like. Rustic ochre coloured walls, art deco style lamps with frosted glass, tables and chairs in dark wood with white tablecloths. In short – it looked like a million other Italian restaurants I have visited. The service was very good, I was very well taken care of from I entered the restaurant until the moment I left. When studying the menu, my eyes immediately spotted the lobster raviolis. My mouth started to water, and I knew! There was no doubt in my mind. That was the right choice for that lunch that day! I have had several encounters with these pasta treats during my many visits in Boston. I particularly remember one such occasion with great joy, in a chic seafood restaurant in Back Bay. They served the most luxurious homemade lobster raviolis in delicious saffron and orange sauce, an interesting contrast to the salt and sweet lobster meat. The lobster raviolis served at Assaggio were a revelation! They were beautifully crafted with red and white coloured pasta, presented to me immersed in a delicate, well balanced creamed sauce with green asparagus. The texture was perfect, as the pasta was not overcooked, slightly al dente. The asparagus had a beautiful colour and that nice crunch. The sauce was delicious, thick and creamy. The ravioli filling had those distinct, discreet and sweet flavours of lobster. Whereas the lobster ravioli dish at Back Bay toyed with contrasts of citrus and pepper in the sauce, ravioli and sauce at Assaggio were playing in pure harmony. The sauce could have had a little more bite, a twist of lime and some pepper could have made it even more interesting. Bolero Schwerin - no ring of fire!